Love the polka dot background and the cute bow. You are right, polka dot pumpkins do make a person happy! Fantastic card Maureen, I LOVE the black polka dotted heart! Such a super cute use of Pretty Patches: pumpkin! Love the polka dotted background too! The polka dots and the gingham are so sweet together. I'm with you on Halloween. I make a couple of cards here and there, but rarely send them! This one is fabulous! Love the pumpkins! The most adorable Halloween card I've seen! Love that country charm! This is so CAS and perfect. Love the pumpkin and polka dots. I love that you made such an adorable Halloween card, even though it's not your favorite holiday. :) The combo of gingham and polka dots is super cute! 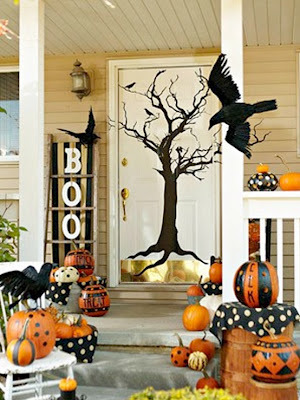 Love the black & white with the bright orange pumpkin! This is such a fabulous CAS design with the perfect mix of gingham & polka dots to give a wonderful homespun feel! Love the clean look of your card and that polka dot paper is to die for. Perfect background for that sweet pumpkin and that little boo tag, just adorable. Super cute, Maureen! 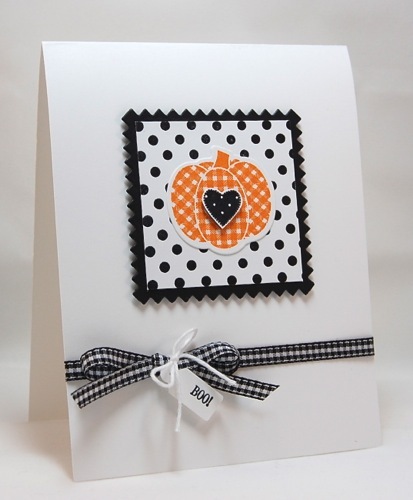 I love the simple combination of elements for your card - the gingham pumpkin and dotted background make a perfect combo! So glad you were able to join our Cloud9 Blog Hop this month! I love your card--it is so cute and country! Maureen, it's polka dot perfection! What a sweet card for Halloween! Thanks so much for joining our Cloud9 hop this month!